Start off your visit on the 29th (Fri): take in breathtaking views at Grand Canyon South Rim, then take in breathtaking views at Yavapai Point, and then get curious at Yavapai Geology Museum. To see maps, more things to do, photos, and more tourist information, refer to the Grand Canyon National Park trip itinerary builder . Livermore to Grand Canyon National Park is an approximately 11.5-hour car ride. You can also fly. The time zone changes from Pacific Standard Time (PST) to Mountain Standard Time (MST), which is usually a 1 hour difference. Traveling from Livermore in March, you will find days in Grand Canyon National Park are slightly colder (57°F), and nights are cooler (23°F). Cap off your sightseeing on the 29th (Fri) early enough to go by car to Sedona. Start off your visit on the 30th (Sat): look for gifts at Trailhead Tea, admire all the interesting features of Red Rock Scenic Byway (SR 179), and then explore the striking landscape at Cathedral Rock. You can drive from Grand Canyon National Park to Sedona in 2.5 hours. When traveling from Grand Canyon National Park in March, plan for a bit warmer days in Sedona, with highs around 67°F, while nights are much hotter with lows around 45°F. Wrap up your sightseeing on the 30th (Sat) to allow time to drive to Phoenix. Phoenix is the capital and most populous city of the U.S. Bring the kids along to Desert Botanical Garden and Phoenix Zoo. Go for a jaunt from Phoenix to Scottsdale to see Taliesin West about 40 minutes away. There's still lots to do: examine the collection at Musical Instrument Museum, don't miss a visit to On The Edge Gallery, admire the natural beauty at Japanese Friendship Garden, and get engrossed in the history at Heard Museum. For photos, ratings, traveler tips, and more tourist information, refer to the Phoenix road trip planning tool . You can drive from Sedona to Phoenix in 2.5 hours. Other options are to do a combination of taxi and flight; or take a shuttle. 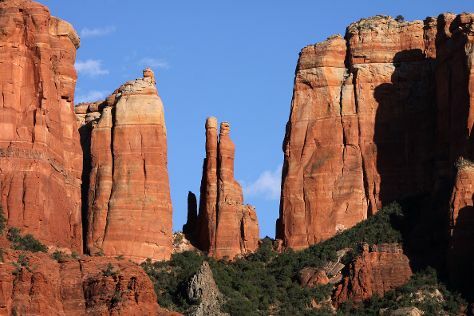 Traveling from Sedona in March, expect Phoenix to be a bit warmer, temps between 82°F and 57°F. Finish up your sightseeing early on the 2nd (Tue) so you can go by car to Palm Desert. Palm Desert is a city in Riverside County, California, United States, in the Coachella Valley, approximately 14 miles (23 km) east of Palm Springs and 122 miles (196 km) east of Los Angeles. Attractions like Lions, Tigers & Bears and Eagle and High Peak Mine make great kid-friendly stops. Get out of town with these interesting Palm Desert side-trips: The Bird Watcher (in Julian) and Anza-Borrego Desert State Park (in Borrego Springs). There's still lots to do: have fun and explore at Children's Discovery Museum, take a stroll through El Paseo Shopping District, trek along Bump and Grind Trail, and explore and take pictures at Shields Date Garden. To find more things to do, reviews, maps, and tourist information, read Palm Desert trip itinerary planning app . Getting from Phoenix to Palm Desert by car takes about 4.5 hours. Other options: fly; or take a bus. The time zone changes from Mountain Standard Time (MST) to Pacific Standard Time (PST), which is usually a -1 hour difference. In April, daily temperatures in Palm Desert can reach 89°F, while at night they dip to 61°F. Finish up your sightseeing early on the 6th (Sat) so you can travel back home.